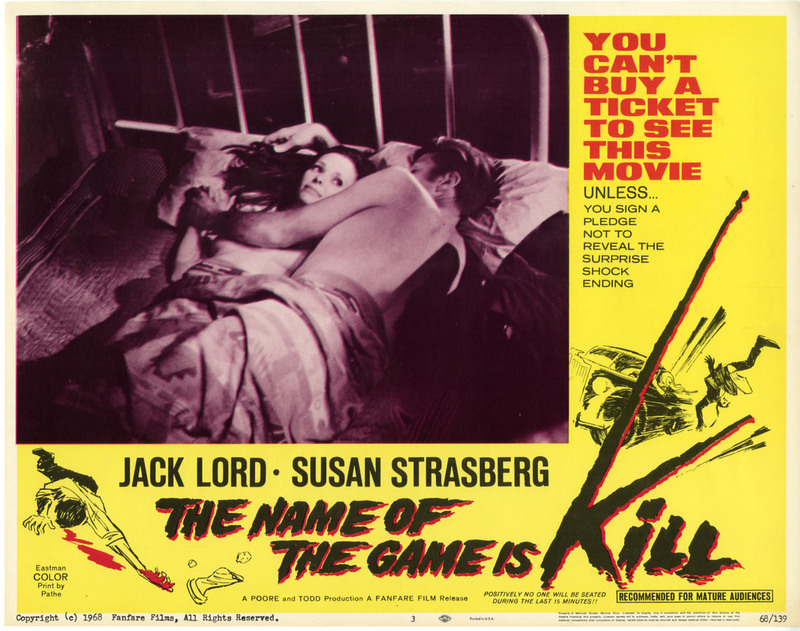 Digi-Schlock: THE NAME OF THE GAME IS KILL (VCI DVD) – Schlockmania! It pays to be optimistic if you’re a genre fan. The ranks of the genre fanbase tend to be the most tenacious when it comes to unearthing forgotten films and reviving them on home video – and each year sees plenty of miraculous cinematic recoveries making their way back to the digital realm. 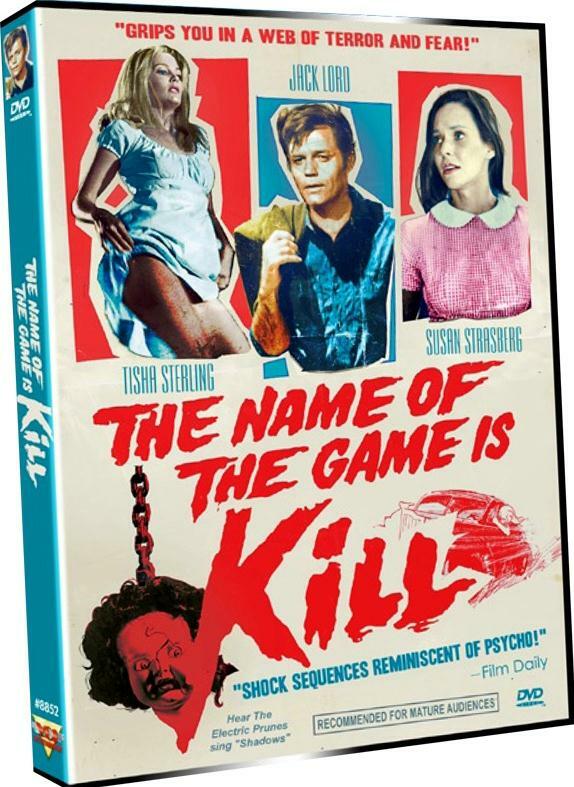 One of the latest discoveries in this vein is The Name Of The Game Is Kill, a forgotten psycho-thriller that has made its home video debut on DVD after decades out of circulation. In the true genre-fan spirit, it has been given an impressive “bells and whistles” treatment that will please lovers of lost films. 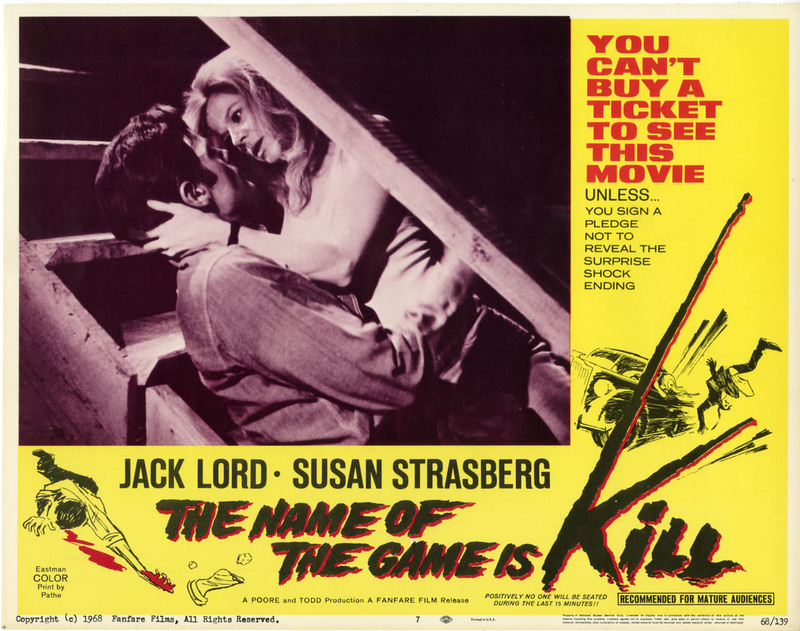 It’s amazing that The Name Of The Game Is Kill made it to disc at all, as the negative is long-lost and film materials are as rare as the proverbial needle in a haystack. The anamorphic transfer for this disc was compiled from rare 16mm prints supplied by collector Harry Guerro and director/collector Joe Dante. Due to the advanced age of these materials used, the transfer is rather soft on detail. However, the results are still watchable and colors can be surprisingly vivid in spots despite a slightly pale look overall. As said above, it’s a miracle to be able to see it all so psycho-thriller devotees shouldn’t find it difficult to cope with the less-than-standard quality to enjoy this rarity. In terms of audio, the mono soundtrack sounds pretty good for its age. Beyond the film itself, the big draw with this disc is its surprising and detailed batch of bonus features. Both disc and bonus features were masterminded by Daniel Griffith through his Ballyhoo Motion Pictures company and he does an ace job of shedding light on the unexpectedly complex story behind this film. First up amongst the extras is a commentary track that features screenwriter Gary Crutcher with Griffith as moderator. It’s an entertaining track from the get-go: Crutcher hits the ground running in the first half, taking the viewer through the inspirations for the script, the thorny path it followed to getting made and the oft-combative atmosphere on the set. Griffith offers the occasional interjection during the first half but comes to play a more prominent role in the second half, guiding Crutcher’s memories in a scene-specific direction and offering some interesting analysis of the story itself. The end results are as informative as they are snappily-paced. The commentary is supported nicely by “Psycho Sisters,” a generous, 40 minute-plus featurette that uses its length to discuss the film’s history from multiple viewpoints. 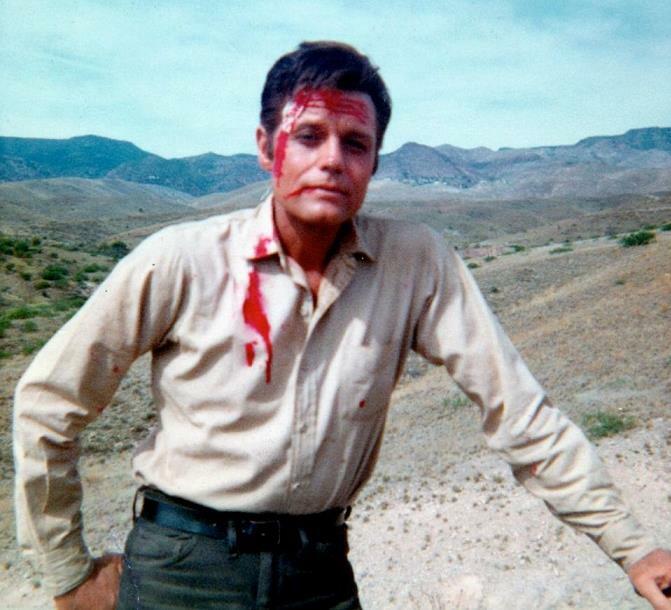 Crutcher acts as the narrative anchor here, expanding on his anecdotes from the commentary: the detailed chronicle of who attempted to make the film is particularly memorable as it includes such names as Curtis Harrington, Rock Hudson and Roman Polanski! Better yet, the featurette incorporates input from cinematographer Vilmos Zsigmond and composer Stu Phillips. Zsigmond offers some fascinating set stories about the difficulties of working with the film’s overbearing director while Phillips offers an interesting account of the methods he used to craft a distinctive score on limited funds. James Lowe of the Electric Prunes even pops up to offer his account of the recording of the film’s memorable song, “Shadows.” Additional analysis and historical detail from filmmakers Joe Dante and Jeff Burr plus genre critic Tim Lucas, all of whom add some nice perspective from the veteran genre-fan viewpoint. Griffith does an excellent job of maintaining a fast pace in the editing and makes skillful use of still images and film clips. If that’s not enough, the disc has plenty more in its extras arsenal. “Schlockmeister” is an expansive reel of trailers for films released by the distributor of The Name Of The Game Is Kill, b-movie specialist Joe Solomon. The trailers – which include gems like Hell’s Angels On Wheels and A Small Town In Texas – are great on their own but there’s also a bonus commentary track for this reel by Temple Of Schlock kingpin/genre film historian Chris Poggiali. There is a mixing glitch over the first few minutes of the track but stick with it because Poggiali offers a highly detailed overview of Solomon’s career plus plenty of factoids on the films he released and some productions that never got made. It’s Drive-In Film History 101, delivered in an involving yet relaxed style. And there’s still more after that. For instance, there are two text essays: “Good News In Jerome” is Poggiali’s fond account of a recent screening of the film in the town where it was made and “Memo From The Flophouse” offers Crutcher’s retrospective thoughts on the film. The disc is rounded out by a vintage t.v. spot, a comprehensive, animated image gallery that covers stills, on-set photos and promo art and a brief 3-minute featurette that has Lowe talking about the legacy of his band, the Electric Prunes. In short, this disc not only rescues a deserving film from obscurity but also piles on a variety of fascinating extras. 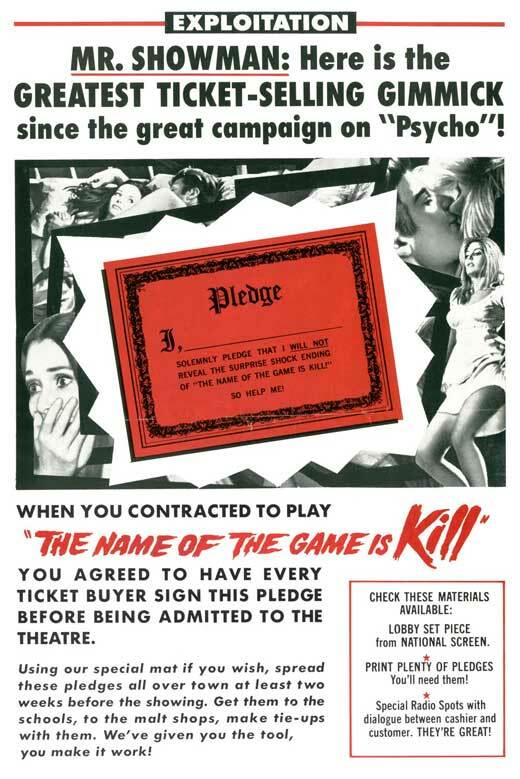 If you like vintage psycho-thrillers or are just interested in genre film history in general, VCI’s disc of The Name Of The Game Is Kill is definitely deserving of your time.